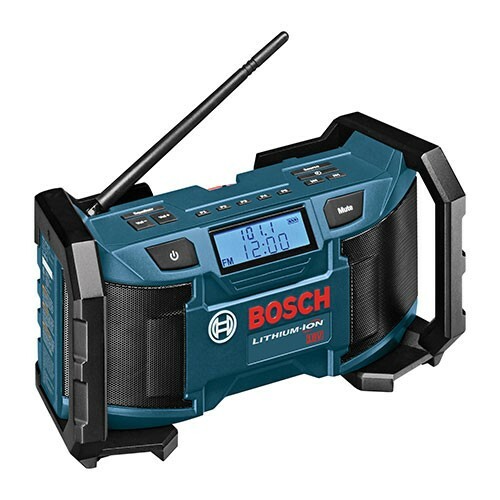 Not wanting to let their 12V users be alone in the joy of having music on the jobsite, Bosch has come out with a similarly designed 18V portable jobsite radio. Unlike their previous 18V radio, Bosch slimmed down the size of the new PB180 so that it can fit inside an L-BOXX-2 tool case. Thanks to neodymium technology, Bosch was able to pack to 5-watt speakers into the small housing of the PB180 Radio. At only 2.8-pounds, you don't have to worry about the added weight the PB180 will add to your tool arsenal. Bosch says you can get two full days of runtime if you use a 4 Ah battery, and a fuel gauge built right into the display will let you know when you are running low. The radio receives both AM and FM stations and uses digital signal processing and tuning to make sure the stations are coming in as clear as possible. If you want to go commercial free, you can plug your mp3 player into the AUX port. The only thing that seems to be missing is a place to put your mp3 player, because I don't know about you, but I don't want to leave mine out in the open. No battery is included, but the included AC adapter will have you blasting tunes right out of the box. I can't find an online listing for the PB180 just yet, but is has a suggested retail of $99.